This article is about the USAF surface-to-air missile. For Boeing's previous research SAM, see Boeing Ground-to-Air Pilotless Aircraft. 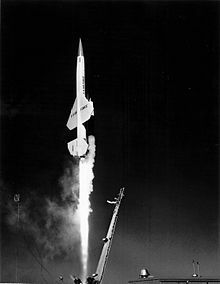 The Boeing CIM-10 Bomarc (IM-99 Weapon System prior to September 1962) was a supersonic long-range surface-to-air missile (SAM) used during the Cold War for the air defense of North America. In addition to being the first operational long-range SAM, it was the only SAM deployed by the United States Air Force. Stored horizontally in a launcher shelter with movable roof, the missile was erected, fired vertically using rocket boosters to high altitude, and then tipped over into a horizontal Mach 2.5 cruise powered by ramjet engines. This lofted trajectory allowed the missile to operate at a maximum range as great as 250 miles (400 km). Controlled from the ground for most of its flight, when it reached the target area it was commanded to begin a dive, activating an onboard active radar homing seeker for terminal guidance. A radar proximity fuse detonated the warhead, either a large conventional explosive or the W40 nuclear warhead. The Air Force originally planned for a total of 52 sites covering most of the major cities and industrial regions in the US. The US Army was deploying their own systems at the same time, and the two services fought constantly both in political circles and in the press. Development dragged on, and by the time it was ready for deployment in the late 1950s, the nuclear threat had moved from manned bombers to the intercontinental ballistic missile (ICBM). By this time the Army had successfully deployed their Nike Hercules that filled any possible need through the 1960s, in spite of Air Force claims to the contrary. The IM-99A had an operational radius of 200 miles (320 km) and was designed to fly at Mach 2.5–2.8 at a cruising altitude of 60,000 feet (18,000 m). It was 46.6 ft (14.2 m) long and weighed 15,500 pounds (7,000 kg). Its armament was either a 1,000-pound (450 kg) conventional warhead or a W40 nuclear warhead (7–10 kiloton yield). A liquid-fuel rocket engine boosted the Bomarc to Mach 2, when its Marquardt RJ43-MA-3 ramjet engines, fueled by 80-octane gasoline, would take over for the remainder of the flight. This was the same model of engine used to power both the Lockheed X-7, the Lockheed AQM-60 Kingfisher drone used to test air defenses, and the Lockheed D-21 launched from the back of an M-21 . The Bomarc relied on the Semi-Automatic Ground Environment (SAGE), an automated control system used by NORAD for detecting, tracking and intercepting enemy bomber aircraft. SAGE allowed for remote launching of the Bomarc missiles, which were housed in a constant combat-ready basis in individual launch shelters in remote areas. At the height of the program, there were 14 Bomarc sites located in the US and two in Canada. The liquid-fuel booster of the Bomarc A was no optimal solution. It took two minutes to fuel before launch, which could be a long time in high-speed intercepts, and its hypergolic propellants (hydrazine and nitric acid) were very dangerous to handle, leading to several serious accidents. As soon as high-thrust solid-fuel rockets became a reality in the mid-1950s, the USAF began to develop a new solid-fueled Bomarc variant, the IM-99B Bomarc B. It used a Thiokol XM51 booster, and also had improved Marquardt RJ43-MA-7 (and finally the RJ43-MA-11) ramjets. The first IM-99B was launched in May 1959, but problems with the new propulsion system delayed the first fully successful flight until July 1960, when a supersonic KD2U-1/MQM-15A Regulus II drone was intercepted. Because the new booster took up less space in the missile, more ramjet fuel could be carried, increasing the range to 430 mi (700 km). The terminal homing system was also improved, using the world's first pulse Doppler search radar, the Westinghouse AN/DPN-53. All Bomarc Bs were equipped with the W-40 nuclear warhead. In June 1961, the first IM-99B squadron became operational, and Bomarc B quickly replaced most Bomarc A missiles. On 23 March 1961, a Bomarc B successfully intercepted a Regulus II cruise missile flying at 100,000 ft (30,000 m), thus achieving the highest interception in the world up to that date. In 1955, to support a program which called for 40 squadrons of BOMARC (120 missiles to a squadron for a total of 4,800 missiles), ADC reached a decision on the location of these 40 squadrons and suggested operational dates for each. The sequence was as follows: … l. McGuire 1/60 2. Suffolk 2/60 3. Otis 3/60 4. Dow 4/60 5. Niagara Falls 1/61…6 . Plattsburg 1/61 7. Kinross 2/61 8. K. 1. Sawyer 2/61 9. Langley 2/61 10. Truax 3/61 11. Paine 3/61 12. Portland 3/61 … At the end of 1958, ADC plans called for construction of the following BOMARC bases in the following order: l. McGuire 2. Suffolk 3. Otis 4. Dow 5. Langley 6. Truax 7. Kinross 8. Duluth 9. Ethan Allen 10. Niagara Falls 11. Paine 12. Adair 13. Travis 14. Vandenberg 15. San Diego 16. - Malmstrom 17. Grand Forks 18. Minot 19. Youngstown 20. Seymour-Johnson 21. Bunker Hill 22. Sioux Falls 23. Charleston 24. McConnell 25. Holloman 26. McCoy 27. Amarillo 28. Barksdale; 29. Williams. The first USAF operational Bomarc squadron was the 46th Air Defense Missile Squadron (ADMS), organized on 1 January 1959 and activated on 25 March. The 46th ADMS was assigned to the New York Air Defense Sector at McGuire Air Force Base, New Jersey. The training program, under the 4751st ADW used technicians acting as instructors and was established for a four-month duration. Training included missile maintenance; SAGE operations and launch procedures, including the launch of an unarmed missile at Eglin. In September 1959 the squadron assembled at their permanent station, the Bomarc site near McGuire AFB, and trained for operational readiness. The first Bomarc-A were used at McGuire on 19 September 1959 with Kincheloe AFB getting the first operational IM-99Bs. While several of the squadrons replicated earlier fighter interceptor unit numbers, they were all new organizations with no previous historical counterpart. Within a year of operations, a Bomarc A with a nuclear warhead caught fire at McGuire AFB on 7 June 1960 after its on-board helium tank exploded. While the missile's explosives did not detonate, the heat melted the warhead and released plutonium, which the fire crews spread. The Air Force and the Atomic Energy Commission cleaned up the site and covered it with concrete. This was the only major incident involving the weapon system. The site remained in operation for several years following the fire. Since its closure in 1972, the area has remained off limits, primarily due to low levels of plutonium contamination. Between 2002 and 2004, 21,998 cubic yards of contaminated debris and soils were shipped to what was then known as Envirocare, located in Utah. In 1962, the US Air Force started using modified A-models as drones; following the October 1962 tri-service redesignation of aircraft and weapons systems they became CQM-10As. Otherwise the air defense missile squadrons maintained alert while making regular trips to Santa Rosa Island for training and firing practice. After the inactivation of the 4751st ADW(M) on 1 July 1962 and transfer of Hurlburt to Tactical Air Command for air commando operations the 4751st Air Defense Squadron (Missile) remained at Hurlburt and Santa Rosa Island for training purposes. A CQM-10B drone launched at Vandenberg Air Force Base, 1977. Following the accident, the McGuire complex has never been sold or converted to other uses and remains in Air Force ownership, making it the most intact site of the eight in the US. It has been nominated to the National Register of Historic Sites. Although a number of IM-99/CIM-10 Bomarcs have been placed on public display, because of concerns about the possible environmental hazards of the thoriated magnesium structure of the airframe several have been removed from public view. Russ Sneddon, director of the Air Force Armament Museum, Eglin Air Force Base, Florida provided information about missing CIM-10 exhibit airframe serial 59-2016, one of the museum's original artifacts from its founding in 1975 and donated by the 4751st Air Defense Squadron at Hurlburt Field, Eglin Auxiliary Field 9, Eglin AFB. As of December 2006, the suspect missile was stored in a secure compound behind the Armaments Museum. In December 2010, the airframe was still on premises, but partly dismantled. Canadian operational deployment of the Bomarc involved the formation of two specialized Surface/Air Missile squadrons. The first to begin operations was No. 446 SAM Squadron at RCAF Station North Bay, which was the command and control center for both squadrons. With construction of the compound and related facilities completed in 1961, the squadron received its Bomarcs in 1961, without nuclear warheads. The squadron became fully operational from 31 December 1963, when the nuclear warheads arrived, until disbanding on 31 March 1972. All the warheads were stored separately and under control of Detachment 1 of the USAF 425th Munitions Maintenance Squadron. During operational service, the Bomarcs were maintained on stand-by, on a 24-hour basis, but were never fired, although the squadron test-fired the missiles at Eglin AFB, Florida on annual winter retreats. No. 447 SAM Squadron operating out of RCAF Station La Macaza, Quebec, was activated on 15 September 1962 although warheads were not delivered until late 1963. The squadron followed the same operational procedures as No. 446, its sister squadron. With the passage of time the operational capability of the 1950s-era Bomarc system no longer met modern requirements; the Department of National Defence deemed that the Bomarc missile defense was no longer a viable system, and ordered both squadrons to be stood down in 1972. The bunkers and ancillary facilities remain at both former sites. Bomarc B on display at the Canada Aviation and Space Museum Ottawa, Ontario, Canada, c. 2006. Air Force Space & Missile Museum, Cape Canaveral Air Force Station, Florida. This pristine artifact is in sequestered storage in Hangar R on Cape Canaveral AFS and cannot be viewed by the general public. ^ Lombardi, Michael. "Reach for the sky" (PDF). Boeing Frontiers. Retrieved 3 November 2018. ^ "BOMARC: Boeing's Long-range A.A. Missile" (PDF). Flight Global: 687. 24 May 1957. Retrieved 4 August 2013. Development of the electronic guidance was assisted by simulated IM-99 nose sections, pressurized by nitrogen and cooled by ammonia, fitted to a T-33 and a B-57, the pilot of these aircraft cutting out the guidance and breaking away from the collision course as the target was neared. … 70 per cent subcontracted): prime contractor, Boeing (assembly of missiles at the main Seattle plant, Pilotless Aircraft Division); cruise propulsion, Marquardt; boost propulsion, Aerojet-General; guidance and control, Westinghouse Air Arm Division; ground control gear, Westinghouse Electronics Division; ground-support and test gear, Farnsworth Division of I.T. and T.; airborne electronic intelligence, Lear (LearCal and Grand Rapids Divisions); nose of missile, Pastushin (glass fibre, leaves radar beams undistorted). ^ Baugher, Joe. "Boeing/MARC F-99". JoeBaugher.com. Retrieved 4 August 2013. ^ "46th Air Defense Missile Squadron." NYADS 1960 Yearbook. Retrieved 28 September 2010. ^ Preface by Buss, L. H. (Director) (1 May 1960). North American Air Defense Command and Continental Air Defense Command Historical Summary: July–December 1959 (PDF) (Report). Directorate of Command History: Office of Information Services. "On 7 October 1959, NORAD provided guidance on this to ADC as follows. Gap fillers will be redeployed to provide low altitude coverage (500 feet) 230 nautical Jl1il~s forward and 150 miles to the rear of all BOMARC launch sites … Criteria for BOMARC coverage is that no lateral gaps exceed 25 nautical miles (normal terrain) at a curve of constant altitude of 300 feet… Directional antennas and high power amplifiers tor the ground-to-air transmitter sites will be programmed and deployed only as required to support BOMARC operations. NORAO Objective Plan 1961-1965 … called for an F-101 squadron for Comox AB, Canada, and a BOMARC squadron for Paine AFB, Washington. To control these squadrons, NORAD also provided for an AN/FPS-28 for the Queen Charlotte Islands. … total off-shore coverage, available from ALRI and land-based sources, would permit use of the BOMARC B only to approximately 70 per cent of its low-altitude and 50 per cent of its high-altitude range capability. In the last six months of 1959. two IM-99A squadrons became operational and assumed an air defense role. The first was the 46th Air Defense Missile Squadron (BOMARC) based at McGuire AFB, New Jersey…activated on 1 January 1959, operational on 1 September 1959 with three missiles. …the 6th Air Defense Missile Squadron (BOMARC) at Suffolk 6th ADMS activated on 1 February 1959, operational on 1 December 1959. As of 1 January 1960. the McGuire squadron had 24 IM-39A missiles and the Suffolk squadron had four missiles available for air defense. The 26th ADMS, activated at Otis AFB, Massachusetts, on 1 March 1359; the 30th ADMS, activated on 1 June 1959 at Dow AFB. Maine; and the 22nd ADMS, activated on 1 September 1959 at Langley AFB, Virginia. These units were expected to become operational in 1960. NADOP 1959-1963, dated 16 December 1958 [planned for] FY 1963 of 36 IM-99B sites and 2,772 launchers. in the U. S. (excluding Alaska), two in the [Alaska] 64th Air Div1sion area, and two in Canada. In March 1960, the JCS told NORAD that they were considering reducing the BOMARC program to eight U.S. and two Canadian squadrons." ^ Gambardello, Joseph A. "Plutonium Spill Neither Gone Nor Forgotten, 40 Years Later." The Philadelphia Inquirer, 1 June 2000, p. A01. Retrieved: 26 December 2009. ^ Rademacher; et al. (August 28, 2007). …Missile Shelters and Bunkers Scoping Survey Workplan (Report). ADA471460. Air Force Institute of Operational Health. Retrieved 2018-12-09. ^ THOMAS P. FARNER (23 July 2015). "Nuclear 'Cleanup' Leaves Many Questions". The Sand Paper (NJ). Retrieved 26 July 2015. ^ Young, Gord. "Cold War relic on the move." North Bay Nugget, 12 September 2009. Retrieved: 24 December 2009. ^ a b Buteux, Paul. "Bomarc Missile Crisis". The Canadian Encyclopedia. Toronto: Historica Foundation, 2012. Archived from the original on 11 August 2012. Retrieved 11 August 2012. ^ a b CBC Digital Archives. "Voice of Women protest nuclear testing". CBC News, 26 March 2012. Toronto. Archived from the original on 11 August 2012. Retrieved 11 August 2012. ^ a b "The Nuclear Question in Canada (1957–1963)". Diefenbaker Canada Centre. Regina, Saskatchewan: University of Saskatchewan. Archived from the original on 11 August 2012. Retrieved 11 August 2012. ^ "Cold War Canada: The Voice of Women". Canada: A People's History, 2001. Toronto: CBC. Archived from the original on 11 August 2012. Retrieved 11 August 2012. ^ "Bomarc". Encyclopedia Astronautica. Archived from the original on 17 August 2013. Retrieved 7 August 2013. Promising [GAPA] results led to Boeing receiving a USAF contract in 1949 to develop the exotic MX-1599 ramjet-powered, nuclear-armed long-range surface-to-air missile for defense of the continental United States from high-altitude bombers. The last Bomarc A was phased out in December 1964. In April 1972 the last Bomarc B was retired. Test flights of XF-99 test vehicles began in September 1952 and continued through early 1955. The XF-99 tested only the liquid-fueled booster rocket, which would accelerate the missile to ramjet ignition speed. In February 1955, tests of the XF-99A propulsion test vehicles began. These included live ramjets, but still had no guidance system or warhead. The designation YF-99A had been reserved for the operational test vehicles. In August 1955, the USAF discontinued the use of aircraft-like type designators for missiles, and the XF-99A and YF-99A became XIM-99A and YIM-99A. ^ "Factsheets : Boeing XF-99." Archived 17 January 2014 at the Wayback Machine Nationalmuseum.af.mil. Retrieved: 18 September 2013. ^ "446 SAM Squadron." radomes.org. Retrieved: 12 September 2010. ^ "447 SAM Squadron." radomes.org. Retrieved: 12 September 2010. ^ "Bomarc Missile Sites." radomes.org. Retrieved: 26 December 2009. 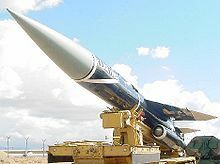 Wikimedia Commons has media related to CIM-10 BOMARC. SAGE-BOMARC risks - Oral history: Les Earnest talks about air defense system called SAGE and a ground-to-air missile called BOMARC.